Background: Behçet’s disease is a relatively uncommon, inflammatory disorder with characteristic mucocutaneous lesions and multisystem involvement, of unknown aetiology; presumably a vascular autoinflammatory syndrome that develops under combined environmental and genetic influences. 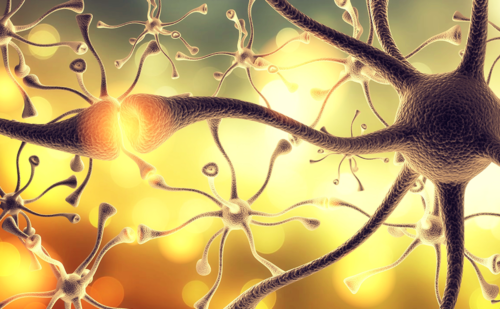 As neuro-Behçet’s disease affects the central nervous system in about 10% of cases and in ways that can mimic other neuroinflammatory conditions, awareness of its manifestations, significance, and management is important for neurologists. In March 2017, a mini-symposium at the 11th Congress of Controversies in Neurology in Athens, Greece, was dedicated to specific aspects of Behçet’s and neuro-Behçet’s disease. 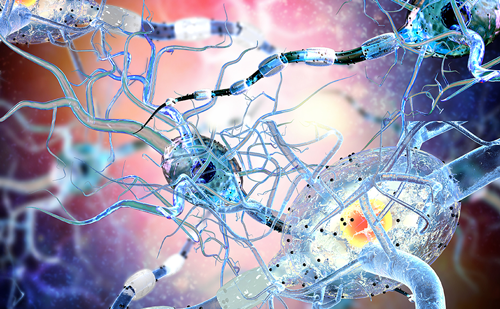 These included an introduction to Behçet’s disease, pathogenesis and treatment, an overview of its neurological manifestations (neuro-Behçet’s disease) and the differential diagnosis from other neuroinflammatory conditions. Illustrative case reports were used. Objectives: To provide a brief overview of neuro-Behçet’s disease that is informative for clinical neurological practice and that follows the structure of the 2017 mini-symposium. Data sources: Relevant recent comprehensive reviews of the subject and relevant original articles and case reports were provided by each speaker at the mini-symposium. This article contains some of these sources and some additions where necessary to emphasise specific points. References are also provided for more comprehensive recent reviews. Limitations: The mini-symposium was an opportunity for providing a brief update and overview of neuro-Behçet’s disease and to exchange ideas and experience among neurologists. As such, it was found to be helpful, but also limited in scope. This resultant article refers to comprehensive reviews on the topic but is not in itself a comprehensive systematic review. Conclusions: Neuro-Bechet’s disease comprises largely two forms, parenchymal and a non-parenchymal. These manifestations seldom overlap in the same individual and may reflect different pathogenetic mechanisms. The principles of treatment largely follow the principles of treating Bechet’s disease in general, with the mainstay being corticosteroids for exacerbations and immunosuppressive treatments for prevention of exacerbations. One notable exception is cyclosporine, which is typically avoided in neuro-Bechet’s disease. Anti-tumour necrosis factor biologicals play an increasing role in treatment. 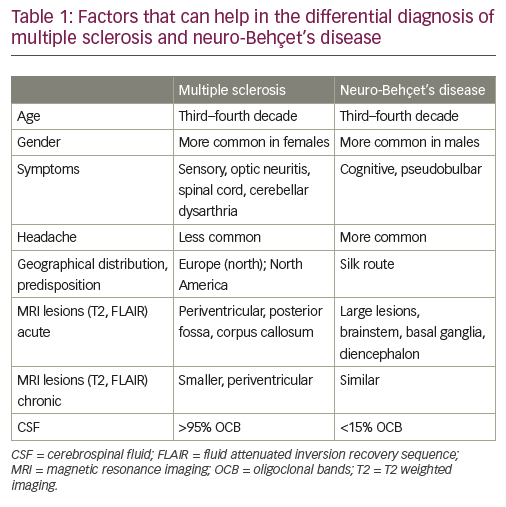 Distinguishing neuro-Behçet’s disease from other neuroinflammatory conditions, such as multiple sclerosis, is essential for both management and prognostic reasons. Selen Ozyurt, Peter Sfikakis, and Aksel Siva have nothing to disclose in relation to this article. Cris S Constantinescu is the Editor-in-Chief of European Neurological Review. He did not act as Editor-in-Chief in relation to the peer review of this article. This article is a report of a mini-symposium and did not involve any studies with human or animal subjects performed by any of the authors. The named authors meet the International Committee of Medical Journal Editors (ICMJE) criteria for authorship of this manuscript, take responsibility for the integrity of the work as a whole, and have given final approval for the version to be published. This article is published under the Creative Commons Attribution Non-commercial License, which permits any non-commercial use, distribution, adaptation, and reproduction provided the original authors and source are given appropriate credit. © The Authors 2018. In addition, numerous other areas are commonly affected by BD. Ocular presentations of BD occur in 30–80% of patients (predominantly in men) and are a major cause of morbidity as they can result in blindness, particularly in the setting of retinal vasculitis.1 Joint involvement is also commonly reported in BD. Mono/polyarthritis in BD is Italicsnon-erosive and the most affected joints are knees, ankles, feet and Italicshands. Gastrointestinal involvement is characterised by pain, haemorrhage, gut mucosal ulcerations or intestinal perforation. ItalicsVascular involvement may also occur, most commonly deep/superficial peripheral venous thrombosis and also aneurysmal/occlusive arterial disease. Cardiac involvement includes coronary arteritis, vascular disease, intracardiac thrombi or thrombosis of venous collateral vessels and superior vena cava, myocarditis and recurrent ventricular arrhythmias.1 Neurological involvement is also a common manifestation of BD, and will be discussed further in the following section. a positive pathergy test (skin prick test): non-specific skin Italicshyper-reactivity in response to minor trauma read by a physician at 24–48 hours (>2 mm pustule, after forearm skin (5 mm depth) prick with 20–22 g needle). For the management of major vessel disease with thrombotic events in BD, corticosteroids and immunosuppressants such as azathioprine, cyclophosphamide or cyclosporine-A are recommended,12 and Italicsanti-TNF-α could be considered in refractory patients. Anticoagulants are considered when the risk of bleeding, in general, is low and coexistent pulmonary artery aneurysms are ruled out.12,13 For gastrointestinal symptoms, 5-aminosalicylic acid derivatives, including sulfasalazine or mesalamine, systemic corticosteroids, azathioprine, anti-TNF-α, and thalidomide may be used. 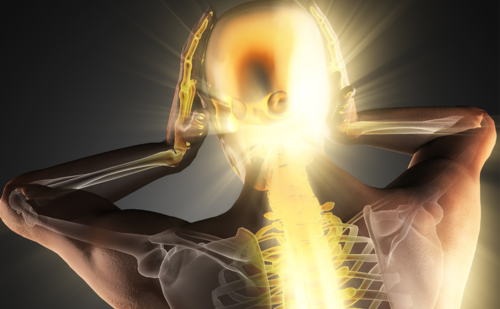 Central nervous system involvement, including acute attacks of cerebral parenchymal involvement, are treated with high-dose corticosteroids followed by tapering, together with immunosuppressants. Cyclosporine, although inexpensive, should be avoided due to the risk of neurotoxicity. Anti-TNF-α should be considered in severe or refractory disease as Italicsfirst-line. 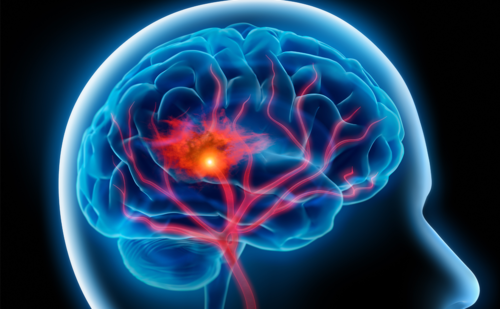 The first episode of cerebral vein thrombosis (CVT) should be treated with high-dose corticosteroids, followed by tapering. Anticoagulants may be added for a short duration. As with systemic disease, the neurological manifestations of BD are varied.18–22 Neurological involvement in BD can be classified as; 1) primary, in which the neurological involvement is directly due to BD and is named as NBD or neuro-Behçet’s syndrome (NBS); and 2) secondary, in which the neurological manifestations are the result of neurologic complications secondary to systemic involvement of BD (i.e. cerebral emboli from cardiac complications of BD, increased intracranial pressure secondary to superior vena cava syndrome) or due to the therapies used for the systemic manifestations of BD (i.e. central nervous system [CNS] neurotoxicity with cyclosporine; peripheral neuropathy secondary to thalidomide or colchicine). These are indirect causes of neurological problems in patients with BD and are not termed as NBD. 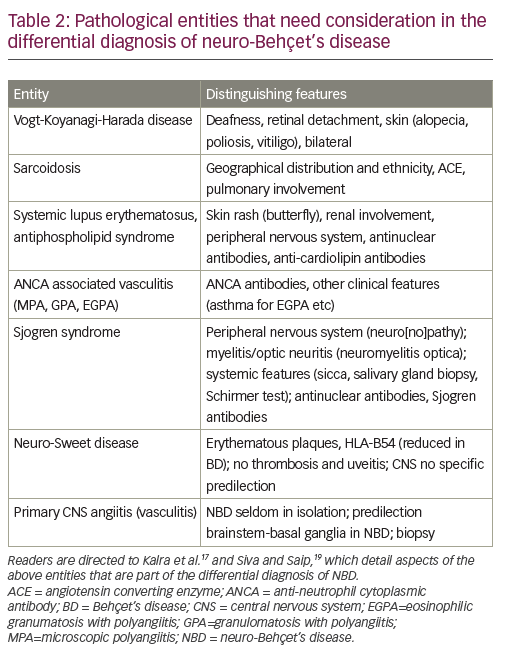 The International Consensus Recommendation (ICR) criteria are suggested to be used in diagnosing NBD.24 These criteria can be summarised as ‘the occurrence of neurological symptoms and signs in a patient who meets the ISG Diagnostic Criteria for BD that are not otherwise explained by any other known systemic or neurological disease or treatment and in whom objective abnormalities consistent with NBD are detected either on neurological examination, neuroimaging studies, MRI, or abnormal cerebrospinal fluid (CSF) examinations’.24 The ICR criteria also include a ‘probable NBD’ criteria, but one should be more prudent in making such a diagnosis. The CSF findings may disclose a prominent pleocytosis and an elevated protein level during the acute episode of p-NBD. Neutrophilic predominance is typical during the acute phase, but this later is replaced by a lymphocytic form. Oligoclonal bands are rarely detected. Up to 20% of patients with NBD have CVST. These patients present with severe headache, which usually develops over a few weeks. Typically, the funduscopic and neurological examination shows papilledema and occasionally a sixth nerve palsy. Compared with other causes of dural sinus thrombosis, impaired consciousness, focal neurologic deficits such as hemiparesis and epileptic seizures are uncommon in extra-parenchymal NBD, and venous infarcts are unlikely. A magnetic resonance venography will confirm the diagnosis and show the extent of CVST. 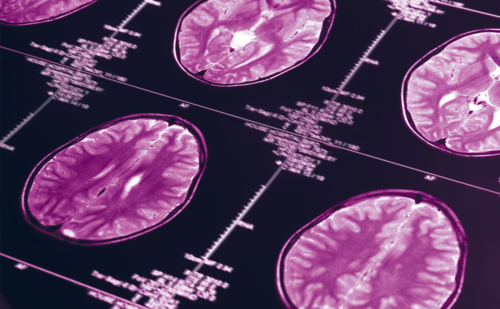 With the exception of an elevated opening pressure, the CSF findings are generally normal, except in the rare meningitic presentation where a high number of neutrophils can be found. As already mentioned this form of NBD occurs more commonly in the paediatric population suggesting that age may influence the form of neurological involvement. The differential diagnosis of NBD remains a major challenge. Particularly difficult are situations in which a patient without full blown BD presents with neurological manifestations. It is important to know that neurological manifestations of BD reflect more severe disease, and are rarely seen in isolation. Therefore, clinicians suspecting NBD must be vigilant to look for the likely development of symptoms and signs outside the CNS. This is also important in patients with known BD, as neurological manifestations tend to appear during severe flare-ups, and systemic BD manifestations should be sought. In meningitic presentations, the differential diagnosis from acute bacterial meningitis is essential. Acute bacterial meningitis is a medical emergency and antibiotic treatment is often initiated in emergency settings before the microbiological confirmation. Although the CSF in meningitic NBD often has fewer leucocytes, it can sometimes reach the numbers encountered in bacterial meningitis and failure of recognition may have serious consequences. A transient clinical improvement can be seen following institution of supportive measures and antibiotics, which may delay the aggressive treatment of BD. acute posterior multifocal placoid pigment epitheliopathy. In patients presenting with acute stroke, the vascular variant of NBD sometimes represents part of the differential diagnosis. To distinguish from non-vasculitis atherosclerotic stroke, it is helpful to bear in mind the higher frequency of venous thrombosis compared to arterial territory stroke in NBD. On the other hand, some strokes in NBD involve arterial territories, so an arterial stroke can be a manifestation of NBD. It is also important to remember that patients with BD are at higher risk of cardiovascular events including stroke, independent of whether they have NBD.33 Arterial dissections and bleeds, albeit relatively rare in NBD, should trigger suspicion of it in the appropriate clinical setting. An important aspect of the differential diagnosis is the development of a neurological problem in a patient with established BD. The clinicians need to establish whether or not the problem is related to NBD. Besides stroke, headache is a very common complaint in people with BD and it does not generally represent a manifestation of NBD. Vigilance is needed, however, as headache often heralds other manifestations of NBD. Finally, an emerging differential diagnosis aspect concerns neurological complications of BD treatment. It is critical not to mistake such complications for the development of NBD. The role of cyclosporine in NBD is important as it has been linked consistently to a potential acceleration and worsening on NBD. Other treatments also may have complications. Immunosuppressive agents may occasionally facilitate meningitis, which can be confused for NBD. 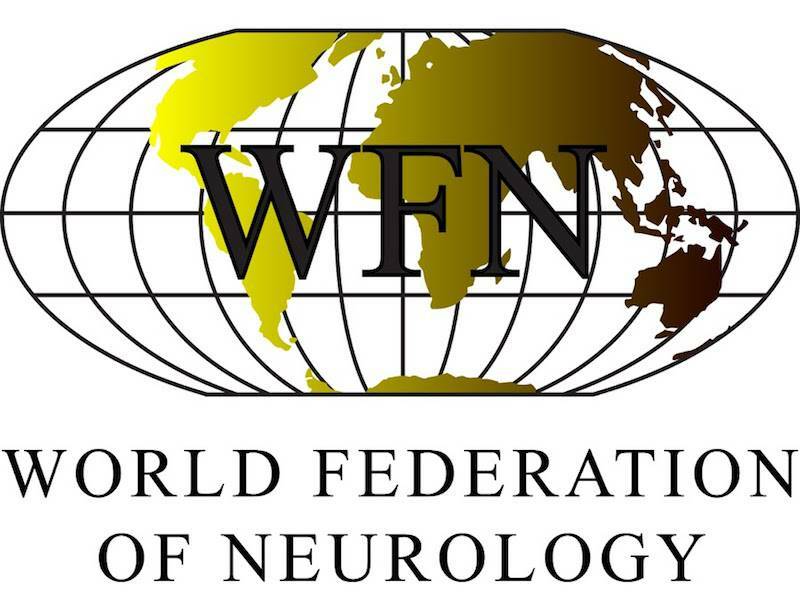 The use of anti-TNF agents such as infliximab, which has been shown to be successful in NBD,36 should require vigilance, as demyelination and other neurological complications have been reported with these agents, although none yet has been reported with use in BD. Thalidomide, which is occasionally used for BD, predictably causes a neuropathy which is not related to NBD. Posterior reversible encephalopathy syndrome has been reported as a complication of several immune therapies including anti-TNF agents, and at the 2017 CONy symposium, an interesting case in BD was reported by Dr George Vavougios from Greece (Oral communication, CONy Congress, Athens 2017). In conclusion, NBD is a serious neuroinflammatory condition which poses major diagnostic, differential diagnostic, and therapeutic challenges. Awareness of its clinical features and therapeutic possibilities together with early diagnosis are essential in the management of NBD. Yazici H, Seyahi E, Hatemi G, Yazici Y. Behçet syndrome: a contemporary view. Nat Rev Rheumatol. 2018;14:107–19. Adamantiades B. A case of recurrent hypopyon iritis. Athens Greece: Medical Society of Athens, 1930; 586–593.3. Behçet H. Uber rezidivierende aphthouse durch ein virus verursachte Geschwuere am Mund, am Auge und an den Genitalien. 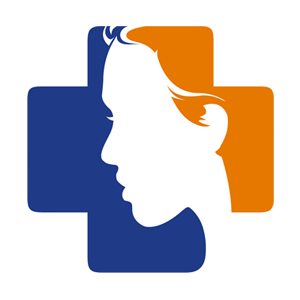 Dermatologische Wochenschrift. 1937;105:1152–7. Maldini C, Druce K, Basu N, et al. Exploring the variability in Behçet’s disease prevalence: a meta-analytical approach. Rheumatology (Oxford). 2017;57:189–95. Remmers EF, Cosan F, Kirino Y, et al. Genome-wide association study identifies variants in the MHC class I, IL10, and ItalicsIL23R-IL12RB2 regions associated with Behçet’s disease. ItalicsNat Genet. 2010;42:698–702. Gholijani N, Ataollahi MR, Samiei A, et al. An elevated Italicspro-inflammatory cytokines profile in Behcet’s disease: ItalicsA multiplex analysis. Immunol Lett. 2017;186:46–51. Niwa, Y, Miyake, S, Sakane T, et al. Auto-oxidative damage in Behçet’s disease–endothelial cell damage following the elevated oxygen radicals generated by stimulated neutrophils Clin Exp Immunol. 1982;49:247–55. Suzuki N, Sakane T, Ueda Y, et al. Abnormal B cell function in patients with Behçet’s disease. Arthritis Rheum. 1986;29:212–9. Lehner T. The role of heat shock protein, microbial and autoimmune agents in the aetiology of Behçet’s disease. ItalicsInt Rev Immunol. 1997;14:21–32. Diri E, Mat C, Hamuryudan V, et al. Papulopustular skin lesions are seen more frequently in patients with Behçet’s syndrome who have arthritis: a controlled and masked study. Ann Rheum Dis. 2001;60:1074–6. No authors listed. Criteria for diagnosis of Behçet’s disease. International Study Group for Behçet’s Disease. Lancet. 1990;335:1078–80. Hatemi G, Silman A, Bang D, et al. EULAR recommendations for the management of Behçet disease. Ann Rheum Dis. 2008;67:1656–62. Merashli M, Eid RE, Uthman I. A review of current management of vasculo-Behcet’s. Curr Opin Rheumatol. 2018;30:50–6. Hatemi G, Melikoglu M, Tunc R, et al. 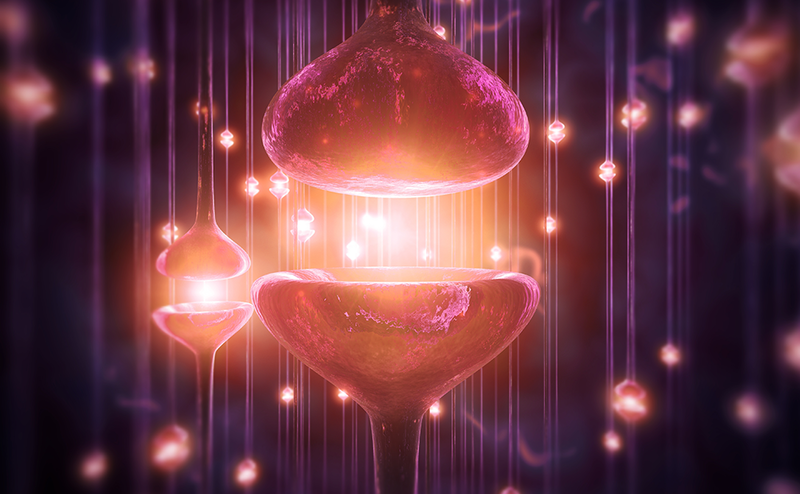 Apremilast for Behçet’s syndrome—A phase 2, placebo-controlled study. N Eng J Med. 2015;372:1510–8. Sfikakis PP, Arida A, Fragiadaki K, et al. Anti-TNF agents for Behçet’s disease: analysis of published data on 369 patients. Semin Arthritis Rheum. 2011;41:61–70. Desbois AC, Vallet H, Domont F, et al. Management of severe complications in Behçet’s disease with TNF inhibitors. Expert Opin Biol Ther. 2017;17:853–9. Markomichelakis N, Delicha E, Masselos S, et al. A single infliximab infusion vs corticosteroids for acute panuveitis attacks in Behçet’s disease: a comparative 4-week study. Rheumatology (Oxford). 2011;50:593–7. Siva A, Saip S. The spectrum of nervous system involvement in Behçet’s syndrome and its differential diagnosis. J Neurol. 2009;256:513–29. Uygunoglu U, Siva A. Behçet’s syndrome and nervous system involvement. Curr Neurol Neurosci Rep. 2018;18:35. Kocer N, Islak C, Siva A, et al. CNS involvement in Italicsneuro-Behçet’s syndrome: an MR study. AJNR Am J Neuroradiol. 1999;20:1015–24. Uluduz D, Kürtüncü M, Yapıcı Z, et al. Clinical characteristics of pediatric-onset neuro-Behçet disease. Neurology. 2011;77:1900–5. Siva A, Kantarci OH, Saip S, et al. Behçet’s disease: diagnostic and prognostic aspects of neurological involvement. J Neurol. 2001;248:95–103. Talarico R, d’Ascanio A, Figus M, et al. Behçet’s disease: features of neurological involvement in a dedicated centre in Italy. Clin Exp Rheumatol. 2012;30(Suppl. 72):S69–72. Kalra S, Silman A, Akman-Demir G, et al. Diagnosis and management of Neuro-Behçet’s disease: international consensus recommendations. J Neurol. 2014;261:1662–76. Gardner RC, Schmahmann JD. Ataxia and cerebellar atrophy–a novel manifestation of neuro-Behçet disease? Mov Disord. 2008;23:307–8. Uygunoglu U, Saip S, Siva A. Behcet’s disease and neuro-Behcet syndrome. EMJ Neurol. 2018;6:77–85. Brazis PW, Stewart M, Lee AG. The uveo-meningeal syndromes. Neurologist. 2004;10:171–84. Maggi P, Absinta M, Grammatico M, et al. Central vein Italicssign differentiates multiple sclerosis from central nervous system inflammatory vasculopathies. Ann Neurol. 2018;83:283–94. Sati P, Oh J, Constable RT, et al. 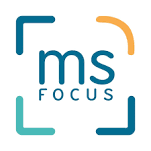 The central vein sign and Italicsits clinical evaluation for the diagnosis of multiple sclerosis: Italicsa consensus statement from the North American Imaging Italicsin Multiple Sclerosis Cooperative. Nat Rev Neurol. Italics2016;12:714–22. Bilge NŞ, Şaylısoy S, Kaşifoglu T, Korkmaz C. Mass-like lesions as a rare form of neuro-Behçet’s disease: A case report and review of the literature. Eur J Rheumatol. 2014;1:34–8. Bennett DL, McCabe DJ, Stevens JM, et al. Tumefactive Italicsneuro-Behcet disease. Neurology. 2004;63:709. Akman-Demir G, Mutlu M, Kiyat-Atamer A, et al. Behçet’s disease patients with multiple sclerosis-like features: discriminative value of Barkhof criteria. Clin Exp Rheumatol. 2015;33(6 Suppl. 94):S80–4. Merashli M, Ster IC, Ames PR. Subclinical atherosclerosis in Behcet’s disease: A systematic review and meta-analysis. Semin Arthritis Rheum. 2016;45:502–10. Özdemir D, Özsoylar G, Candansayar S, et al. Psychiatric findings related to neurological complications in Behcet’s disease: A short review and a case presentation. Int J Psychiatry Clin Pract. 2004;8:185–90. Saip S, Akman-Demir G, Siva A. Neuro-Behçet syndrome. ItalicsHandb Clin Neurol. 2014;121:1703–23. Zeydan B, Uygunoglu U, Saip S, et al. 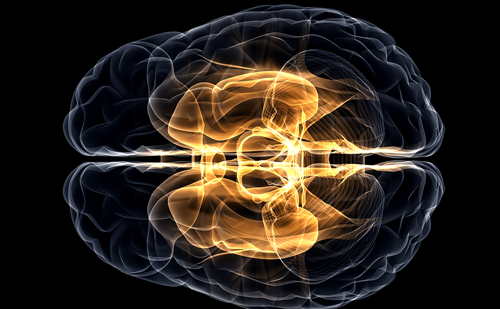 Infliximab is a plausible alternative for neurologic complications of Behçet disease. Neurol Neuroimmunol Neuroinflamm. 2016;3:e258.